Baits:Xtreme Bass Tackle tubes in the pearl silver color scheme; drop shot rigs with ¼ ounce weight and finesse worms; and green pumpkin chatterbait with matching swimbait. 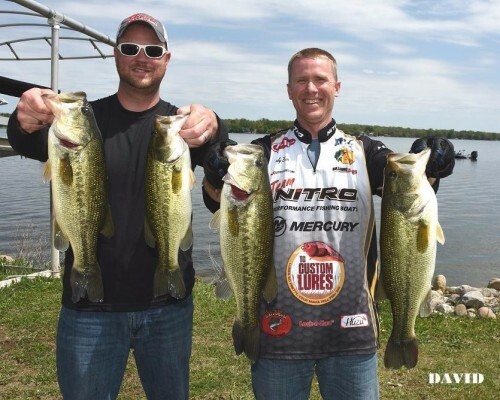 A tie between 5th & 6th place was broken by the big bass. A 3.42 pound largemouth topped the 2.98 pounder weighed by the next team. 6th Place: The 2016 West Division Champions, brothers Kyle and Michael Kaser, got on track to repeat with 13.05 pounds and win $120. 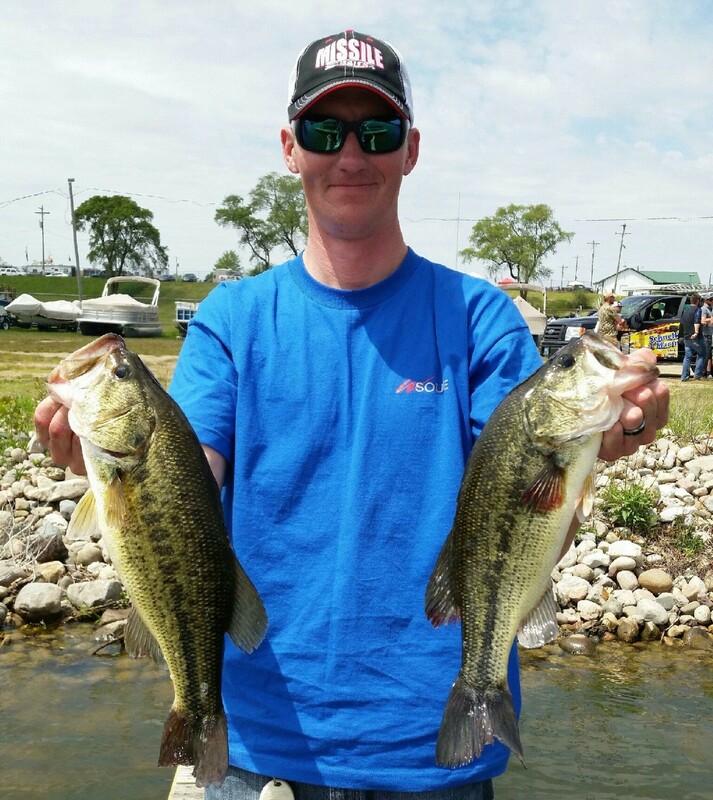 7th Place: The 2015 Season Champions, John Gipson, Jr., and​​ Tom Noe (pictured) finished with 13.03 pounds, won $100, and now stand in second place in the Standings. How it Happened: Friday the team searched the lake for spawning bass. They found many in the channels and a few on the main lake. Of their limit weighed, three were found Friday. Using a homemade fiberglass push pole, the team agitated the spawning fish with their baits until provoking a bite. Boat positioning was key: giving the fish as much space as possible and not creating a barrier between the bed and access to deeper water was paramount. Fifteen keepers fell victim to their tactics. Their biggest fish also gave the biggest battle. The fish immediately swam 15-20 away from the bed upon approaching it, giving the appearance as “uncatchable.” As they passed by it, Fennell pitched a drop shot rig on the bed and left it as it went out of sight. To their satisfaction, the fish came back and bit the rig. It swam violently to the middle of the channel. Before they knew it, Fennell found his rod bent between the motor and boat as the fish was thrashing on the other side. Amazingly the 8 pound fluorocarbon line withstood the strain and after several minutes the battle was over. How it Happened: The team began by targeting fish located on Friday. The first keeper, and smallest in their limit, came from a chatterbait while working a 3.5 pound largemouth. 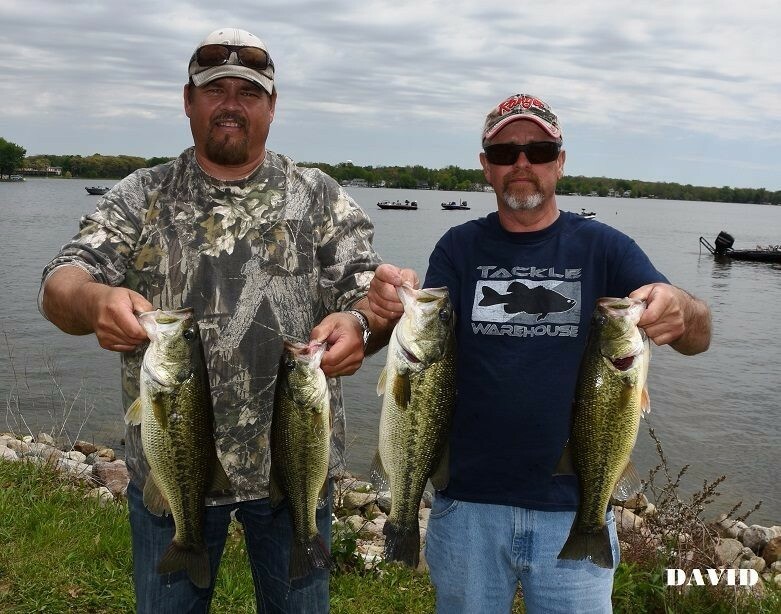 After landing the bedding fish they moved on and captured the Native Pride Tackle Big Bass, 3.93 pounder, off a bed. It fell to a drop shot, but only after it was previously hooked by a jig. After working it for 5 minutes it engulfed a black jig, but spit it inches from the net. It immediately went back on the bed but took 30 minutes to bite the drop shot. 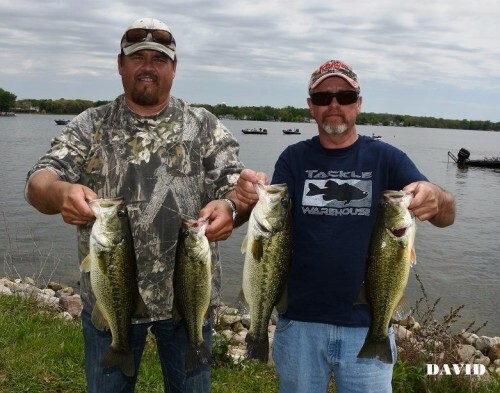 They landed their next marked fish, 3.5 pounds, but found the majority of their other marked fish absent or unwilling to bite. 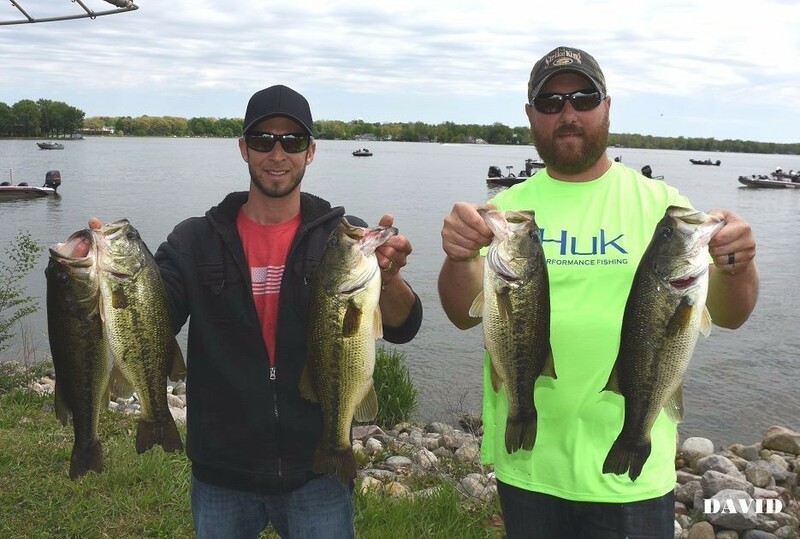 They worked through 10 keepers, and all five weighed came from the main lake. How it Happened: Admittedly, Schwartz and Miller hate sight fishing, but after practicing on Wednesday, they were left with little choice - they could not prompt bites from either pre or post spawn bass. However, they saw many bedding fish in channels and decided to pursue them. It was a good choice as it only took an hour to catch a limit in channels with the drop shot rig. They caught a dozen keepers throughout the day. 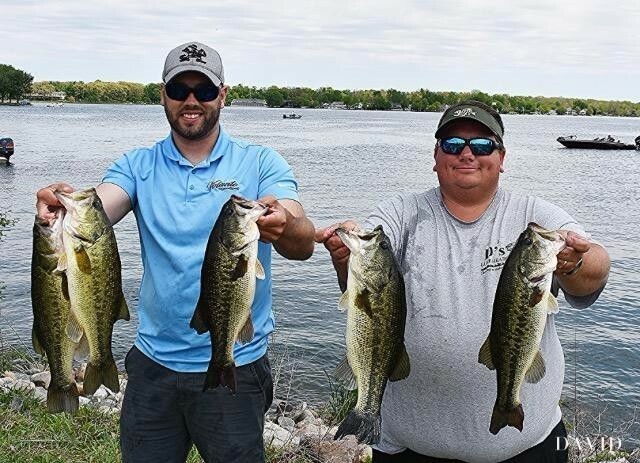 How it Happened: The team knew fish were bedding in the channels and with years of experience on the lake, knew where many would be spawning that were not visible. They took a two pronged approach: on fish they could visible see they pestered with tube baits until they bit. On areas they were confident held fish, but could not see, they agitated with trick worms. 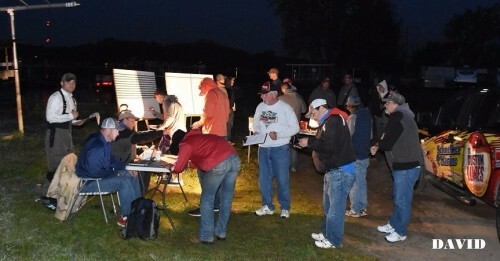 In all, they caught over 20 keepers. How it Happened: The day before, the team with more Top 5 finishes than any other team in R & B History spent time looking for bedding fish on the lake. They found several in both channels and on the main lake. 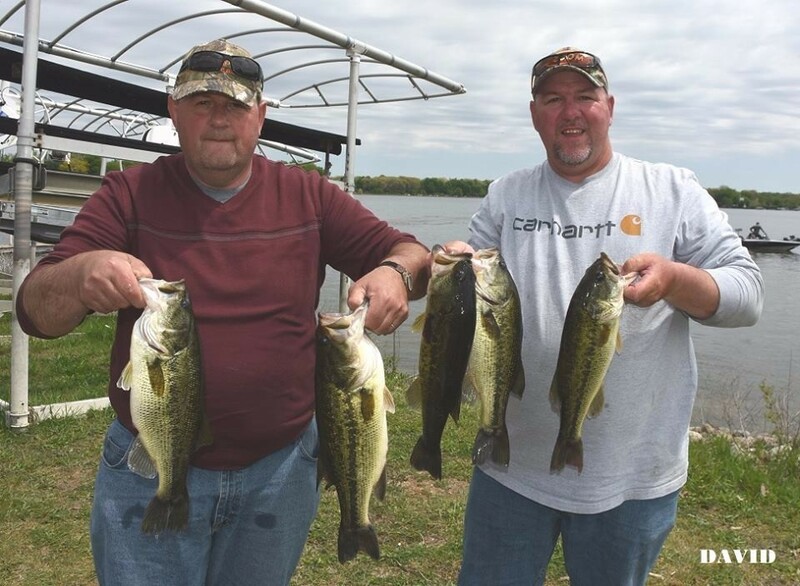 They had their limit by 9:30 and culled three times throughout the day. Their biggest fish, though, came with just 15 minutes remaining. 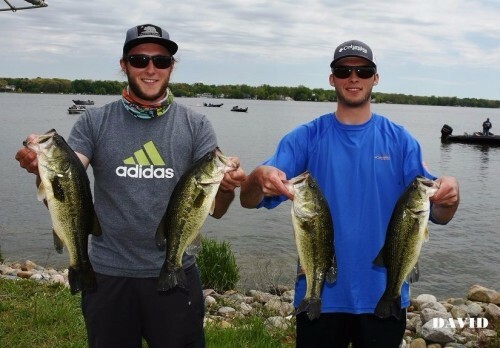 While buzzing around on the trolling motor looking for a large fish they fan casted wacky worms and caught a 3.42 pounder. All five of the fish came from the main lake. 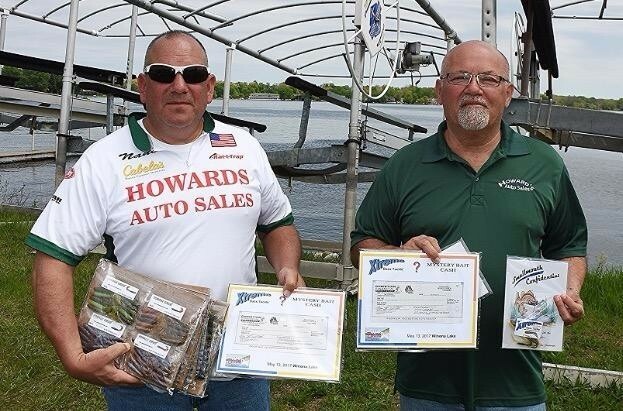 It only took one fish that weighed 1.40 pounds to win Bob Howard and Laureano Santos over $200 in cash and prizes from Xtreme Bass Tackle. They selected and used the correct Mystery Bait - a 4" tube in the froggy color scheme. Photos taken by Professional Photographer David Hamrick can be viewed and purchased by clicking on the link.